Amritsar, April 6: The Border Security Force (BSF) on Friday early morning eliminated a Pakistani smuggler and nabbed one alive at Border Out Post Ramkot falling in Amritsar. Four Kg of heroin was also recovered from their possession. Notably, Pakistan sends terrorists in Kashmir to spread terrorism while in Punjab it sends drugs so that the youth exploit their future and life. He further said that after reaching on the spot, the patrolling party noticed movements of two Pakistani carrying something with them, were warned to stop marching but they kept on marching towards BSF troops in aggressive postures. 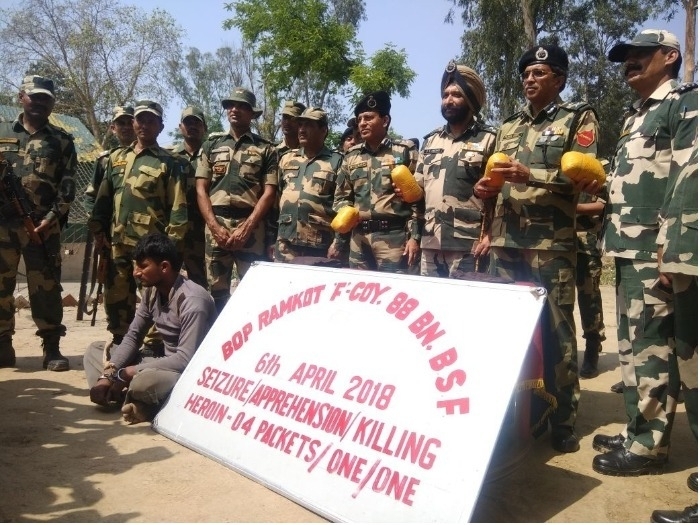 “On repeated warning when Pakistani intruders didn’t stop, BSF Patrolling party opened firing in which one was shot dead and another was arrested with four-kilogram heroin,” he added. The deceased has been identified as Rashid, while the one arrested is Sabir Ahmed from Lahore district. Meanwhile, a case has been filed against Pakistani intruder Sabir Ahmed and preliminary interrogation is launched to bring out the truth as who was a receiver on the Indian side and for whom they were bringing huge drug consignment from Pakistan to the Indian side and how long they were in the drug smuggling across the border. In the month of December last year, BSF recovered 13.26kg heroin from the border outposts (BOPs) of Daoke and Bharopal on the India-Pakistan border in Amritsar district, Punjab.